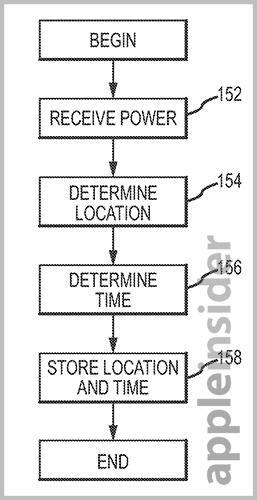 The U.S. Patent and Trademark Office on Thursday published an Apple patent application for an intuitive mobile device control system that automatically powers down certain components depending on a user's location and habits, thus maximizing battery life. In its aptly named application, "Power management for electronic devices," Apple describes a system that detects a mobile device owner's usage patterns, estimates the required energy needed to run the phone between charges, and dynamically turns hardware off or closes running software to achieve maximum battery life. The invention also brings location data into the mix for enhanced efficiency. 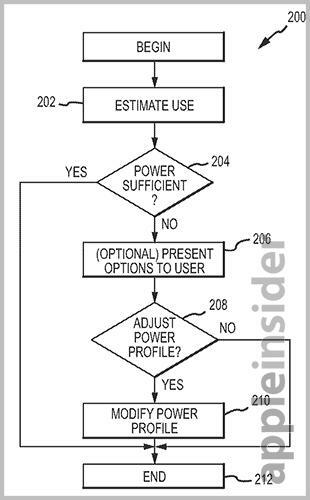 According to the document's background, the invention is designed to compensate for power-hungry mobile devices and increased user interaction. As an example, the filing notes a typical user may charge their device before leaving for work, then use GPS navigation, watch videos and make multiple phone calls before having a chance to recharge. While battery drain is not a critical concern for all users at all times, some situations, like traveling, call for a longer lasting phone. To help reduce power consumption, Apple proposes a system that can compare the estimated time period a user will spend on their device with battery reserves, determining whether the device has sufficient power to last for said period. If the battery does not have sufficient power, the system will adjust "one or more characteristics" to conserve energy. In one embodiment, the system can store charging locations and corresponding device data by using an on-board GPS radio. Example data can be type of power source, typical charge time, and typical travel time to and from locations. The device then stores the typical charging locations and usage patterns in a database, from which a power management scheme is calculated. Flowchart of basic power management cycle. For example, using a GPS sensor the mobile electronic device may determine, based on its current location, that it may be at least eight hours before the mobile electronic device will be recharged or otherwise connected to an external power source. In this case, the mobile electronic device may modify the power management scheme by adjusting one or more characteristics or settings. In some examples, the mobile electronic device may reduce a data fetching rate (e.g., for email or other data), decrease a display brightness, turn off select applications or prevent those applications from running, and so on. The power management profile can be dynamically updated depending on usage requirements or location. Users can manually adjust or input charging data into the system, allowing for a certain level of customization. Finally, the method can also deduce who is using the device based on typical usage patterns. For example, one device user may take a specific route to work, while another may stay at home near a charging location. Based on the selected profile, the system is able to predict usage for a given time period and mete out energy accordingly. Flowchart of power management cycle with customization options. It is unknown if Apple plans to implement the technology in a future device, but the company's iPhone and iPad lineup is expanding its feature set, while decreasing in physical size. A system that is able to dynamically manage power in an intuitive and effective manner would be a welcome addition to any portable device. 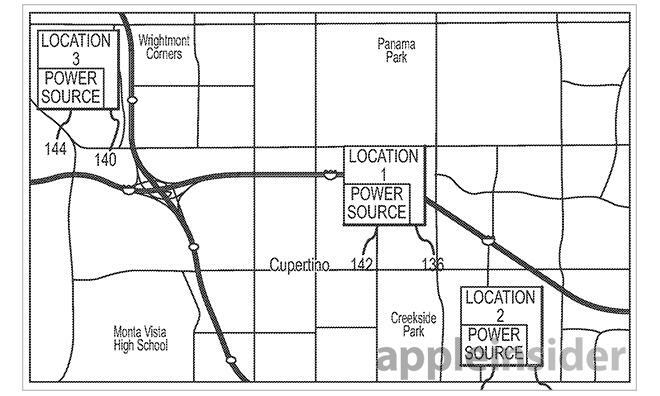 Apple's GPS-enabled power management system patent application was first filed for in 2012 and credits Michael I. Ingrassia, Jr. and Jeffery T. Lee as its inventors.